Focusing on the US markets, I wrote in my last Market Update ‘Roll Out the Barrel’ – 9-19-2013: “Should there be a selloff in the markets similar to the last time this drama (looming partial government shutdown) played out in the media, I view it as a buying opportunity for a possible fourth quarter rally to close out the year.” What a rally the 4th quarter of 2013 was too. The S&P 500 was up a total return of 10.5% for the quarter. Currently many assets that performed poorly in 2013 have performed favorably thus far into the new year. The big question for many investors is what to do now. I have come across more conflicting predictions for the year ahead than I can remember in any year past. Consider this year’s famed Barron’s Round Table – an annual gathering of some of the biggest and most well-known money managers in the world by Barron’s that investors the world over have been enjoying for more than a decade. This year’s Round table is titled: “The Good, The Bad and The Ugly: A Guide to 2014”. I invite you to click the link or go to www.barrons.com to read this year’s round table to see the range of predictions and lack of consensus amongst the esteemed panel. I’ve written on this before in past Market Updates but since I am questioned about inflation and the status of the US dollar at every recent meeting where I am asked to speak and I continue to read inaccurate articles I thought it warranted covering again. If you’ve been reading my Market Updates for a while then you know I don’t see the dollar imploding anytime soon and I don’t see the risk of inflation on the near horizon either. In response to this I am usually bombarded with headline statistics about money printing and interest on US Debt mostly. Without going into a very long discussion let me briefly say there are two simple reasons for my opinions beyond my belief in and the history of innovation which I discussed in my 8/20/2013 AJC article “Overcome investor fear with history”: first, central banks are printing money globally, not just the US. This basically preserves the global status quo which leaves the dollar as the cleanest dirty shirt (to quote Bill Gross) against the Euro and the Yen; second, demographics. I find that most of the hyper-inflation-dollar-imploding camp bases their reasoning on the history of the 1970’s recession. To me this is circumstantial as there is a major difference between now and then due to simple demographics (see Harry Dent’s widely followed and publicized works on demographics and spending). You see Mr. Dent has shown in his work that peak spending for the average person in the US is around the ages of 46 – 50 when their kid(s) are nearing the end of college. After this 46 -50 age, average spending decreases (homes paid down, kids out of college – even if they are not working, supporting them at home is less than college expenses on average). During the 1970’s recession the largest part of the population was the young baby-boomers whereas today the dominant segment of the US is at or past the peak spending point according to Mr. Dent’s work. In fact according to Mr. Dent the US is on a spending slide that is not expected to bottom until around 2022 – when the Echo boomers are all in the spending spree ages. I was born in 1967 so I am part of the smallest demographic group called Generation X (birth-dates from roughly 1965 – 1984) which is sandwiched between the massive Baby Boomers (birthdates from 1946 – 1964) and Echo Boomers (birthdates from 1985 to 2004 – aka Millennials, aka Generation Y – see they are so large they even have multiple names for their group). If a spending decline like this happens it would most likely have a deflationary impact though it may also lead to a major economic/market decline. Even though Mr. Dent has been calling for a major stock market crash for several years now, I will remain on the lookout for signs of this potentially major trend. As I have said in many of my recent past Market Updates, there are as many data points to support markets going higher as there are for it to go lower. Consider one of the factoids that I watch closely: the amount of margin debt. Margin is basically borrowing against securities. 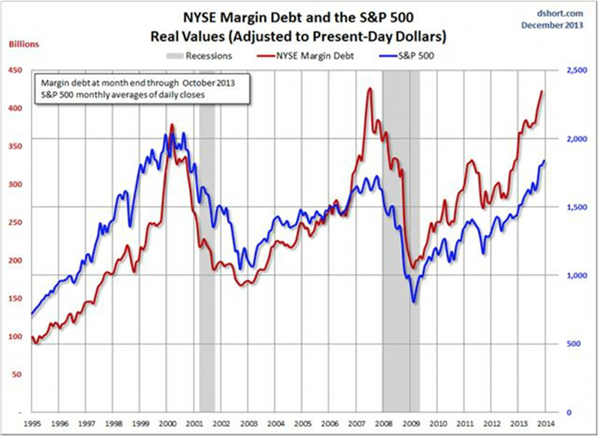 In a very informative essay put out by Doug Short on Dec 30, 2013 he lays out the eerie parallel of the S&P 500 Index versus the NYSE margin Debt, I have included the chart from this essay depicting the relationship but I encourage you to read the entire article by clicking here. The thought with this is that a sell off is coming because there is no more money to drive stocks higher since buying power is maxed. This chart alone would give even the most bullish investor pause. Currently though, opposing the idea of this chart is the fact that there remains near record amounts of cash on the sidelines which is unusual with so much margin. Consider another conflicting data point: insider selling has been historically high for several quarters while corporate stock buyback programs have been at the historically high end for the same if not longer time. In summary there seems to be a great deal of disagreement amongst analysts and investors as to what is going to happen in the markets fueled by a world of conflicting data making me believe that unlike last year, 2014 could be a very volatile year for many markets. We will remain on guard in case the correction turns into a sharp enough decline that creates margin selling which could have much more negative impact upon the stock markets than a 10% correction. I continue to prefer a tactical approach to investing during these uncertain times. I will continue to communicate what available data is telling me about the markets and encourage you to contact us with any questions or to discuss your portfolio/situation at your convenience. I hope you and your families are safe and warm during this national cold front impacting so many people. The ideas expressed in my Market Updates are simply my opinion. No one can accurately predict future events with consistency. My decision making is always first and foremost for your benefit; prudence and perspective govern my decision making. ← Market Update – Shale Boom Busted?